On Thursday we were on the move again and would end the day in Cape Coast. However, first we had some site visits. 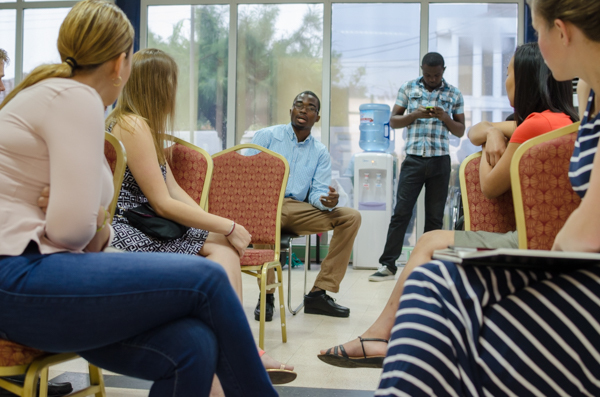 We started the morning at HUB Accra, a co-working space turned incubator. We were met by board member William Senyo who challenged the students to convince him to add UT to his short list of possible MBA programs for himself (a list that currently includes Stanford and Booth). William has some experience with Austin since he had been sponsored to attend SXSW Interactive in the past. In William's opinion, Southby is a top five event experience and everything that it claims to be. Though he agrees, it is way too expensive. Immediately the presentation discussed the issues of finding space that we had heard at many of our other sessions. According to William, landlords require renters to provide 1-3 years of rent up front. Start-ups simply do not have the ability to raise that sort of capital, and HUB started as a co-working space to address this issue. Rent is not the only pre-pay issue in Ghana. Everything is pre-pay here. From phone minutes to electricity. As William put it, if you don't have money in your pocket, you're screwed. I was a little skeptical of one HUB company William described. It sounded a lot like the pay day loan companies garnering so much criticism in the U.S. right now, but with a bit of that indentured servant to the company town feel as well. The company offers short-term loans for items you can purchase in its own ecommerce store and appears to have the ability to garnish wages. Definitely something I am wary of. 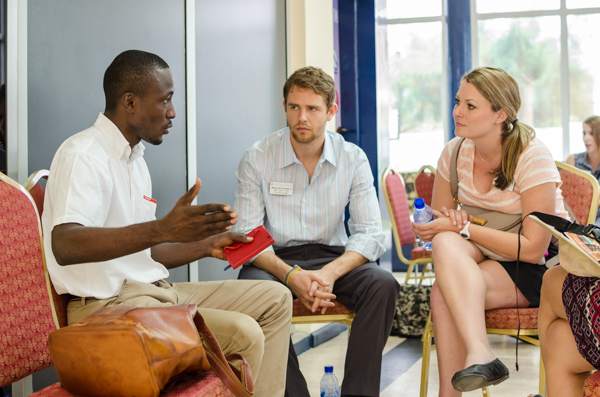 William was surprised that the co-workign model did not start in Ghana first, as it is just a natural way to work there. What does a co-working space offer? Internet access. Networking with other entrepreneurs. Cheap rent. In William's opinion, businesses in the U.S. do not need a HUB for internet or rent. It's the networking that is nice there. However, in Ghana, all three of these things are make or break for companies. According to William, it is a no-brainer that co-working should have developed there a decade ago. Imagine what is possible if you empower people instead of governments. *Maybe I should look to see if I am related to this Hoffman? After hearing from William, several of the start-ups working at HUB presented on their businesses. 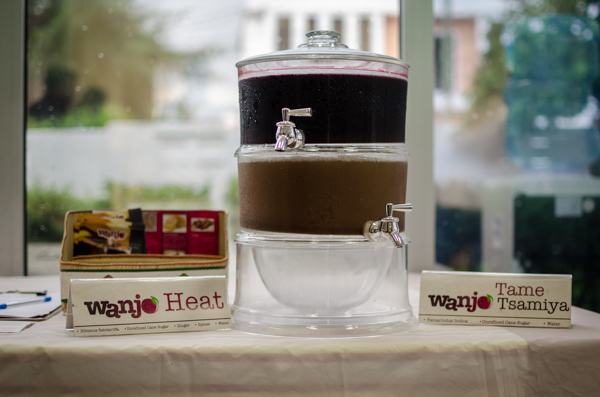 Two start-ups, TroTro Diaries* and Wanjo have garnered some international attention. *Tro tros are a mini-vans that are a common form of public transportation in Ghana. They were originally named for the cost of the ride which was two tros. The goal is to lift people out of poverty (and make a lot of money while doing so). You cannot do business here and not be social. The core of your mission should be to lift people out of poverty. It's good business and its human. To that extent, HUB is looking for companies that can impact one million people by year five. 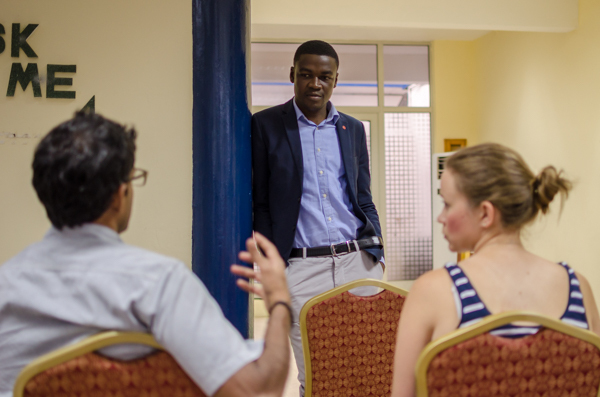 Another role William sees for HUB is to provide a soft landing to international companies looking to enter into or scale up in Ghana. HUB can build teams with the necessary local knowledge to scale ready-to-go products with emerging markets potential. 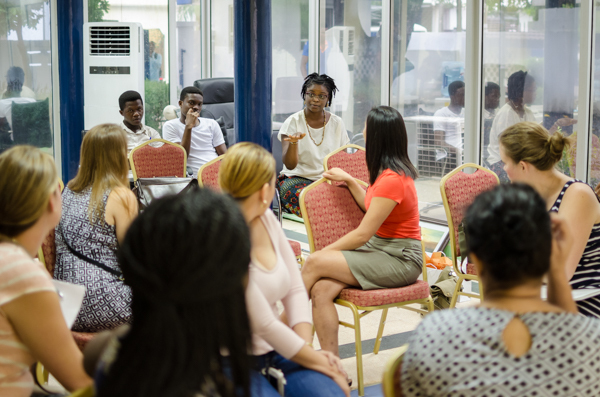 William ended the session challenging the students to make a commitment to supporting at least one entrepreneur with their time or talents. 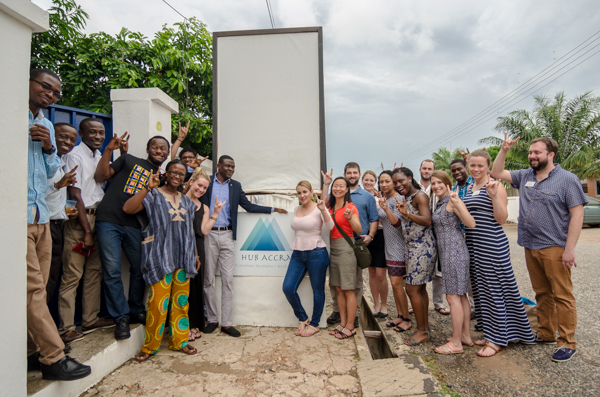 Since I clearly had a lot to say about HUB Accra and I know I have a lot more to say about our next site visit, I am going to split this day's blog entry into two. Tune in later to learn what we did in the afternoon on Thursday.